SHE'S A DARK presence in an opera that begins with a dragon slaying and ends in a burst of sunlight. We first meet her as a bereaved mother who wants her beloved daughter rescued from the clutches of an evil sorcerer. The next time we see her, she has become an evil and vengeful woman, whose power is finally vanquished by the forces of good. 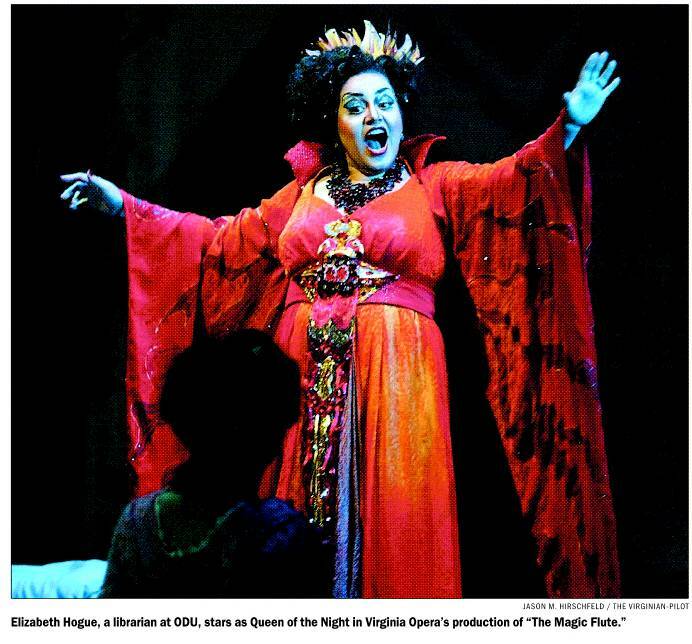 She is the Queen of the Night, and she is at the center of Mozart's "The Magic Flute," which the Virginia Opera opens Friday at Harrison Opera House in Norfolk. Playing the Queen will be Virginia Opera veteran and soprano Elizabeth Hogue, taking her first leading role with the company. Mozart's Queen is one of the most challenging parts in the soprano repertory, although it consists of only two arias and a brief ensemble, as well as snatches of dialogue. It all sounds pretty easy until one looks at the notes. The queen has to sing high and fast, all the way up to a high F. She has to be able to portray a powerful figure in the drama, and she has close to an hour of downtime between her two major appearances. Hogue, who lives in Norfolk, has definite opinions about the role. She sees the Queen not as a cardboard figure of evil but as a proud woman who feels betrayed by the world of men, and who is eventually consumed by her anger and desire for vengeance. cast with lighter voices." While this makes the high-flying sections of the part effective, these light voices often vanish in the lower reaches of the role. Hogue, the music librarian at Old Dominion University, describes herself as a dramatic coloratura, a voice capable of reaching the high notes, executing all the filigree written into the part, and having enough heft to hit the low notes as well. These voices usually are singing more demanding parts in operas by Verdi, Rossini, and Donizetti — “the operas no one wants to do,” Hogue laughed. But at this point in her burgeoning career, she hopes the queen will get her noticed enough so that some of those other parts might come her way. Hogue's career path has not been the typical conservatory/competition route of most singers today. The California native started out at the New England Conservatory but returned to San Jose State, where she majored in theater. For a considerable time, she didn't even sing. Instead she headed into the world of libraries and eventually ended up at the University of Southern Maine. There she finally resumed singing and was cast as the Queen of the Night in a school production of "The Magic Flute." When ODU called five years ago, Hogue began singing in the Virginia Opera chorus, eventually covering leading roles like Puccini's Tosca. She also started playing smaller parts. For example, last season she gave two powerful cameos in Giordano's "Andrea Chenier." Her portrait of the old blind woman Madelon was especially moving, and it was the more notable as the part is written for a contralto. She showed no vocal difficulty at all and stole the scene from the principals during her brief time on stage. She is thrilled at the chance to do the Queen again. Part of this excitement comes from working with conductor Dan Saunders and with the support she feels from her friends in the chorus. "The energy I feel from them is very special." While she has no plans to leave ODU, she now has management, thanks to "Chenier" co-star Frank Porretta. 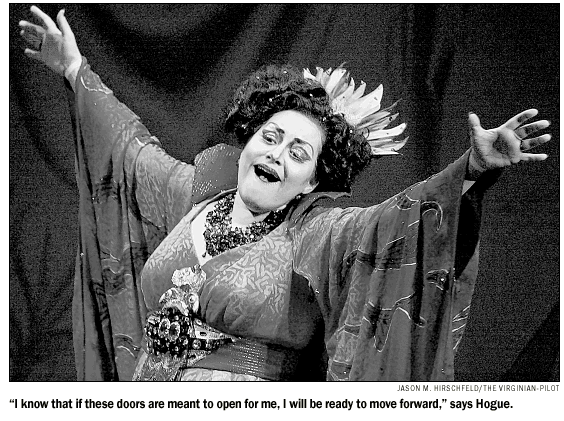 She adds, "I know that if these doors are meant to open for me, I will be ready to move forward."